Few men have rendered better service in their own circuit than Mr. John Sutcliffe, the steward of Manchester Sixth. Though in his eightieth year he performs the duties of his office unaided. Born in Knowlwood (Todmorden), he became at the age of ten a teacher in our Sunday School. Becoming a member in 1847 he took his first appointment on full plan on his twentieth birthday. 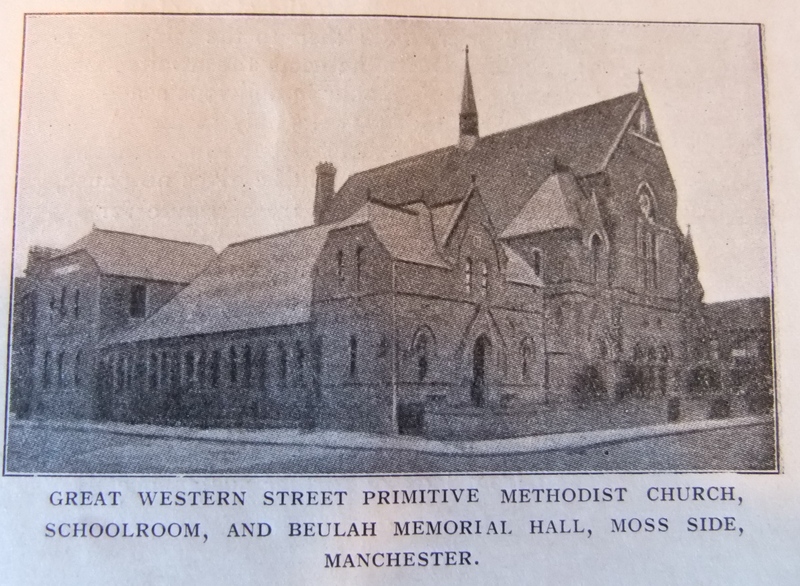 In 1863 he removed to Manchester and joined our Moss Lane Church and when the Great Western Street cause was started in 1876 was transferred thither. 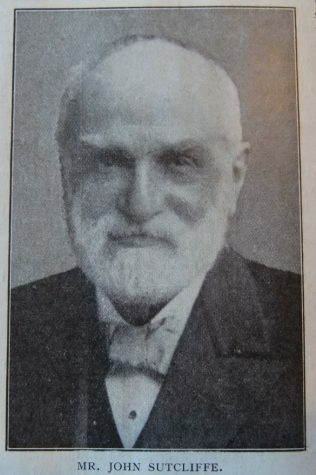 When the division took place (1885) he became the first (and only) steward of the new circuit, having previously acted for many years in that capacity in the parent circuit. Of his sacrifices for his church and his devotion to his work nothing can be said here save that the successive ministers of this station all admit that they have never seen circuit books better kept. 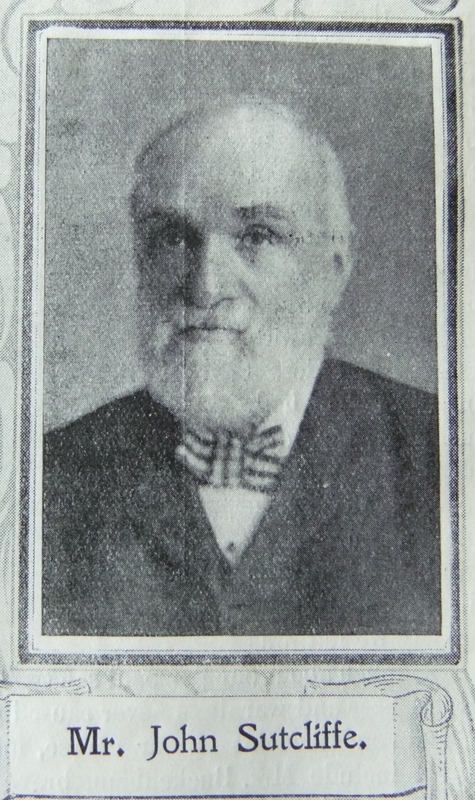 John was born on 29 July 1829 at Knowl, nr Todmorden, to parents William and Mary. William was a book-keeper. John was baptised on 27 February 1930 at Christ Church, Todmorden. 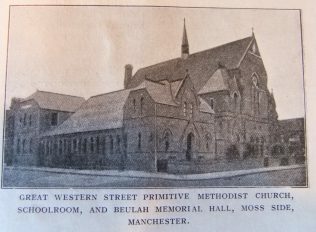 John was deeply involved in the building of the Great Western Street Church, which opened on the first Sunday in May 1878. He was treasurer of the Trust from its beginning. It went on to become the church where many of the students as Hartley College worshipped. John worked as a commercial traveller, employment which involved frequent absences from home and long journeys. 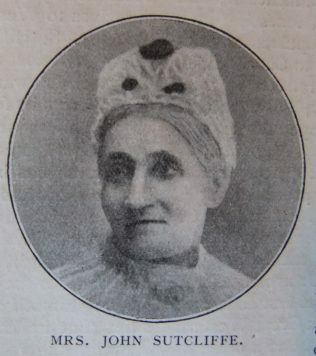 John married Philis Greenwood (abt1830-1901) in early 1854 at Todmorden. John died on 12 December 1914 at Moss Side, Manchester, Lancashire.